It is early in the morning and I am awake before the rest of the crew. I am sipping on some coffee at the condo where we will be staying until we depart St. Croix. It has been over a week since my last entry, so let me fill you all in on what’s been happening! Capt. Jim Whipple came to collect us from the airport, and we headed off to our home-away-from-home for the next few days at Pelican Cove Condos at the Palms. With all of our countless bags of luggage (not to mention quite a few passengers! ), even our deluxe maroon minivan didn’t stop us from rivaling our best stuffed-sardines-in-a-can impression. As we were on our way to the condo though, we all decided to make a pit stop to see the brand new Trilogy IV, in all her glory. Let me just reiterate - I speak for all of the crew when I say that she is straight up jaw-dropping GORGEOUS! After sufficiently fawning over our new boat, we received information about how the upcoming days would unfold and then continued on our way to the condo to try to shake off the jet-lag. We spent the first five nights at Pelican Cove in hopes of departing St. Croix according to plan (read: MUCH earlier). However, with unavoidable delays looming before us - most importantly that our spare engine parts were still stuck in a nearby shipping container - we were forced to find another place to stay for the additional time. Fortunately, Raquel a.k.a RaGhoul (explanation of this awesome new nickname to follow) jumped on the task and discovered a great condo right down the street within walking distance. The condo is nautically themed with anchors everywhere, and we all feel that this is the perfect place for this group of salty sea dogs. Although we are all bummed about the delay, the extra time did give us the opportunity to learn a fraction of the incredibly complex process that is the construction of a luxury catamaran, and from the actual people who build them at Gold Coast Yachts! We learned all about the core materials used, how the hulls are shaped and cast using high density double-cut foam, and got a quick briefing on the elaborate electrical system. We also had the chance to chat with the builder, Jeff Bison, about a couple last minute tweaks/changes/additions we thought of that would help to improve our day-to-day operations of the catamaran, once she enters into the official Trilogy tour rotation. NOW! On to the boat! We had heard that the first sea trial of Trilogy IV was the morning we arrived, just prior to us hitting the tarmac at the St. Croix airport on the 25th, which was actually why Nick Shaw was not able to greet us when we landed. Nick excitingly informed us later on that day that they got to sail on both tacks and had completed the final tuning of the rig. And last week, Saturday 9/29, our little crew got to take the brand-new Trilogy IV out for the second sea trial!!! SO STOKED!!! The whole delivery crew, plus a couple close confidants of Jeff’s, got to join in the fun. Jeff navigated cautiously out of Salt River Marina and we all got to take turns at the helm. Raquel raised the mainsail almost entirely by herself, and I helped crank the winch just a little at the end to get it to the top. 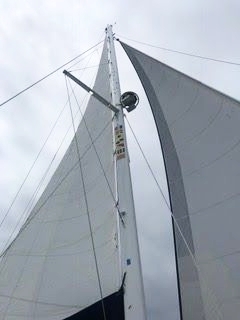 We also let the jib sail all the way out and adjusted the sails to maximize our speed. The boat (with no motor and full main and jib) sailed that day at just over 9 knots. The final touches of Trilogy IV still have to be completed in the coming days before she is ready to leave St. Croix, but to be a part of this once in a lifetime experience was unforgettable. With the engines on, the brand new Gold Coast Yacht was almost silent and just so incredibly responsive. As we cruised back to the Marina, we were all casually milling about on the deck when all of a sudden, Jeff went full throttle and every one of us had to scramble to avoid falling over backward. We quickly looked back at Jeff, startled, and saw that he was grinning from ear-to-ear, clearly pleased with his little trick, but mostly excited about the level of horsepower this new boat held. And that’s all for now! I have to get going, as we have a lot planned for Captain Katie’s birthday - unfortunately it’s a surprise though, so I have to keep it secret until the next blog, juuuust in case she reads this looking for hints. Til next time!